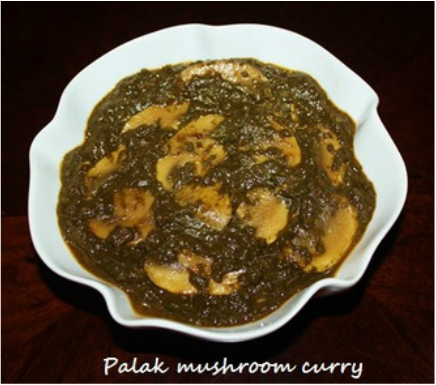 Palak Mushroom is a delicious combination. Once Mushrooms were grown only at the base of Himalayas and that is the reason they were not part of Indian cooking. Mushrooms use to be a special treat in the weddings or a special occasion. Recently they are cultivated as white mushrooms and have become very popular. Mushrooms are cooked with different combination, like with Mutar (green peas), capsicum (shimla mirch), eggs, cheese and meats and each of them is delicious. The mild taste of mushrooms blends beautifully with the Indian spices. In this recipe mushrooms are cooked with spinach. 1. Thaw the spinach and transfer it in a sauce pan and boil it for 15 to 20 minutes. and chopped green chilies and grind them. Keep it aside. 3. Slice the mushrooms and keep them aside. 4. Use a food chopper or blender to mince the onions and garlic. Mixture should be coarse. 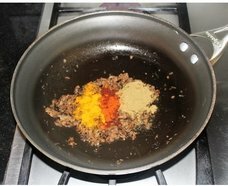 turmeric powder and mix with the fried onions and cook for few seconds. 9. Add Tomato puree. 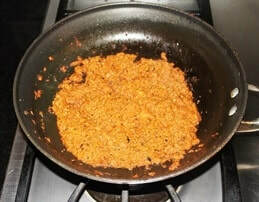 With the tomato puree onion masala become watery turn the heat high for 2 to 3 minutes, so that water evaporates quickly and then turn the heat down. Keep stirring the onion masala frequently. 10. In about 5 to 6 minutes tomato puree and onion will blend together. 12. Add the boiled grinded spinach, sliced mushrooms, salt and 1 cup of water, and mix with the onion masala, cover the pan and cook on medium heat for 15 to 20 minutes, stirring periodically so that onion masala and spinach mix well all the time, and cook. 13. If the spinach is too thick then add more water. Once spinach change its green color to yellowish green and mushrooms are cooked to the desired taste and you have the desired consistency add gram masala and 2 tablespoons butter and mix and cook for few minutes. Turn the stove off. spinach in the onion maslsa and cook and follow the direction as above. 2. One pound of fresh spinach is equal to 6 cups chopped spinach and after boiling equal to 1 cup. 2 minutes or until the red chilies fried, turn the heat off.